Mortgage rates have dropped to an all-time low across the country, however with Utah’s already affordable housing prices it makes the monthly payments on a new home or refinance even more attractive. Mortgage rates dropped to yet another modern-day record low. The benchmark 30-year fixed-rate mortgage fell 7 basis points this week, to 4.81 percent, according to the Bankrate.com national survey of large lenders. A basis point is one-hundredth of 1 percentage point. That 4.81 percent is a record low in the nearly 25-year history of Bankrate’s weekly survey. For the previous two weeks, the benchmark 30-year rate had stood at 4.88 percent, and that had been the record low. According to records kept by the National Bureau of Economic Research, rates of FHA-insured mortgages averaged 4.81 percent in June and July, 1956, and 4.78 percent that May. That seems to be the last time rates were lower than now. The mortgages in this week’s survey had an average total of 0.44 discount and origination points. One year ago, the mortgage index was 5.8 percent. Four weeks ago, it was 4.92 percent — at the time, also a modern-day record low. The benchmark 15-year fixed-rate mortgage fell 6 basis points, to 4.26 percent. The benchmark 5/1 adjustable-rate mortgage fell 6 basis points, to 4.13 percent. 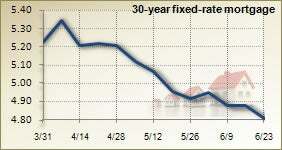 The jumbo 30-year fixed-rate fell 7 basis points, to 5.63 percent. Link to story: Mortgage analysis for June 24, 2010. This entry was posted on June 28, 2010, 9:00 pm and is filed under Mortgage. You can follow any responses to this entry through RSS 2.0. Both comments and pings are currently closed.